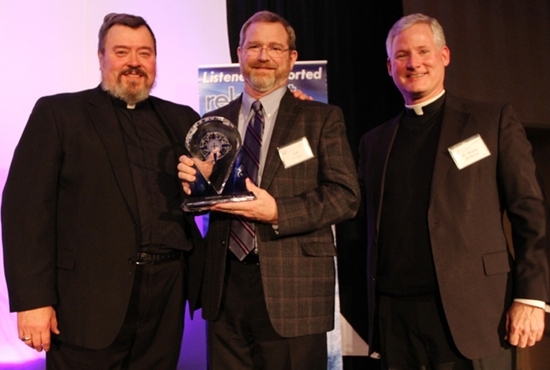 Jeff Cavins, center, holds the Christ Brings Hope award he received from Relevant Radio during the annual Christ Brings Hope Banquet April 23 in Bloomington. Cavins has worked extensively with the station over the years and is the director of Evangelization for the Archdiocese of St. Paul and Minneapolis. Joining Cavins on the stage are Father Richard Simon, left, and Father Rocky Hoffman. Father Hoffman is executive director of Relevant Radio and Father Simon hosts a daily radio show on the station.